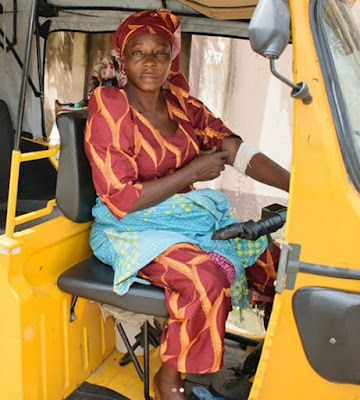 While speaking in an exclusive interview with Splufikstory, an elderly Nigerian woman who lost her husband while she was pregnant with their third child, shared the story of how she turned to a Keke driver to make a living. The widow said she had been in the frozen foods business before her husband died, adding that after his death she was robbed. She revealed further that she began to sell provisions after pleading with her friends to borrow her capital, adding that she was robbed three times while selling the provisions and she was left in debt. "I used to sell frozen foods when my husband was still alive. He died when I was one month pregnant with my last of 3 children. I was still managing at the shop until thieves came to rob and carted everything away. The suffering became intense as a widow with no source of income. After so much begging, my friends helped me raise money to start a new business. I started collecting and selling provisions and soft drinks in wholesale. But this time, I got robbed thrice. After the first robbery, I managed to borrow money from people to restock a little, but as soon as I started making profit, thieves came again and packed everything. The manager of the depot where I was collecting goods felt pity for me so I was given goods on loan with the agreement that I will pay back as soon as I start making profit. For the third time, thieves came again. Honestly, I don't know if I was being setup, but I've handed everything to God. I'm still in debt at the depot as we speak. I had to sell my generator to pay back a little from what I owed, so they've agreed to allow me pay N4,000 weekly until my debt is cleared. I'll complete the payment by August. I started this Marwa business on September 9 last year. I collected it on loan for N1million and I've been paying back N16,100 weekly. I was told that if I don't complete the payment by November this year, they will collect it back, but if I do, it will become mine fully. That was our agreement and I've been paying them weekly for 10 months now. Honestly, I still prefer frozen foods business because this keke business has too much wahala. I had an accident last month, a bus driver hit my keke from behind and it summersaulted thrice. I regained consciousness in the hospital where I spent a week and then another two weeks at home. I only just resumed work again three days ago after I noticed my children were crying of hunger. I still feel pains in my legs and left hand."